Lismore City Council recently erected a new sign at Robert White Bridge in honour of the man described as having “fearless courage” in advocating for ratepayers. Spanning Leycester Creek in South Lismore and known to many as the ‘humpy bridge’, it was named in honour of Robert White during a ceremony in 1926. Mr White was an Alderman with Lismore Municipal Council for 28 years and served as Mayor from 1914-1915. He was also born within 100 yards of the bridge at 2 Crown Street in 1867. His parents were emigrants from England and are buried in the old cemetery in Terania Street, North Lismore, a stone’s throw from their son’s namesake. Several of Cr White’s great grandchildren came to see the new sign erected and were thrilled their great grandfather will continue to be remembered for his contribution to the Lismore community. “When Robert died in 1932, there was a huge funeral procession in the main street of Lismore,” great-granddaughter Jill McCann said. The Northern Star wrote of his passing in 1932 at the age of 65, stating that he was a member of Richmond River County Council (formerly the Hyacinth Board) and president of many community organisations. He was a past Grand Master of the Manchester Unity Oddfellows and a state director of the society. He also volunteered with the Lismore District Hospital, was a member of the North Coast A&I Society and was instrumental in developing the first Lismore Show. The article also stated that his love for flowers was well-known, and he was president of the Lismore Horticultural Society as well as being a respected judge at local flower shows and garden competitions. He was described as having a “heart as tender as a child” beneath his rugged exterior and having “little time for humbug” as he believed that “work not words was the thing that counted”. “A shrewd mind and sound business capacity, combined with a strong personality, guided the late Mr White through his civic life,” one Northern Star article read. “He was a man with a wonderful knowledge of local history, he having watched the town grow from its infancy. He often told vivid stories of the sufferings and hardships of the early pioneers, in which he bore no small share. 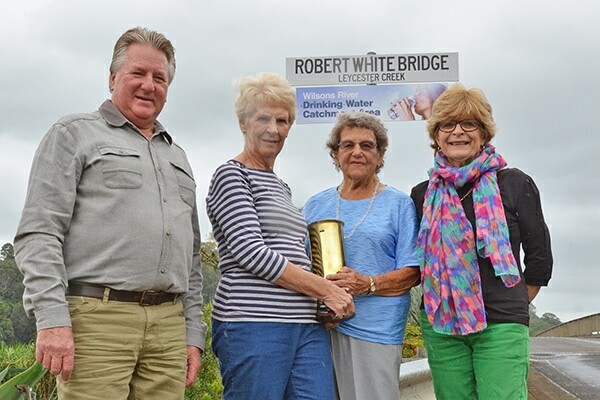 Image: Robert White’s great grandson Chris Mitchell, great granddaughter Lyn McLean, granddaughter Phyllis Mitchell and great granddaughter Jill McCann with the newly erected sign and an artillery shell that was presented to Alderman White and his wife Elizabeth at the bridge opening in 1926. It was engraved as a “token of esteem by residents of South Lismore”.